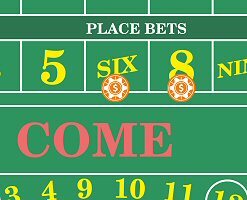 How to win at Craps with Place Bets on 6 & 8 only. Today we continuing our recent series on craps betting strategies. We’ve already talked about two unique systems, or betting patterns, known as the 3 Point Molly and the Iron Cross. This time we’ll take a look at a cheaper craps system that offers similar odds of winning. In short, the object is to set equal wagers on Place 6 and Place 8. At a table with $5 minimums, it will cost as little as $12 to set up ($6 per bet). You won’t be tossing out another $12 per roll, either. Best of all, it offers a house edge of just 1.52%; worse than strategy-based blackjack, but far better than roulette, and similar to baccarat. That is, of course, the simple explanation. Keep reading to find out why this is one of the better ways to safely manage your bankroll, and ensure maximum entertainment for your wagering dollars. Place Bets are wagers that can be made on a specific number. They’re often referred to as Point or Box numbers, because they’re the only numbers that can be established as a point on the shooter’s come out roll. They include 4, 5, 6, 8, 9 and 10. The odds associated with each Place Bet number varies. The following chart shows the true odds, payout, and resulting house edge for each. Examine closely, and you’ll see why Place Bets on 6 and 8 are the only viable options for this craps betting strategy. Because the 6 and 8 payout closest to the true odds, they offer the lowest house edge of 1.52% All other Place Bets present terrible odds of 4% to 6.67%. As every gambler knows, the lower the edge, the better the chance of winning. The chart also shows why we must place these wagers in increments of $6. Place Bets on 6 and 8 pay 7-to-6, meaning for every 6 units wagered, a win will pay 7 units. If you were to place a $5 wager, you would get only $5 in return since the boxman rounds payouts to the nearest dollar. Suffice to say, $6 bets are critical to the value of this strategy. Unlike Field Bets, which last for a single roll, Place Bets remain on the table until the shooter craps out (rolls a 7). If the shooter rolls a 3, a 9, a 5, another 3, a 12, a 4, a pair of 10s and then finally rolls an 8, you still win. All of those previous rolls mean nothing. Your bet is never removed unless a 7 rolls, in which case you lose them both. Even when you win on 6 or 8, the bet stays in play. You will receive the winnings, but the bet doesn’t come down until a 7 is rolled, or you tell the boxman to remove it (your bet is returned). Last but not least, let’s take a look at the odds of rolling a 6 or 8, versus crapping out with a 7. Technically, the 7 has the higher odds of rolling. However, since you’re betting on 6 and 8, you combine these odds for a 27.78% chance of winning, versus 16.67% chance of losing. That leaves a 55.55% chance of any other number rolling (i.e. nothing happens). While that sounds like incredible odds, let’s remember each win brings you a 7-unit payout, while each loss results in a 12-unit decline. Thus, all in all, you have a 1.52% house edge to compete with, which comes out to a negative expectation of $1.52 per $100, or a loss of $0.18 per $12. As always, the casino has the advantage, so you can’t expect every time that you’ll win at craps with Place Bets on 6 and 8. But expecting to lose $0.18 each time the shooter craps out offers a whole lot of entertainment value on a budget bankroll. With a little luck and responsibility on your part (i.e. knowing when to walk away), you just might come away with some extra change in your pocket!